Nairobi Kenya: live uplink transmission by Globecast. 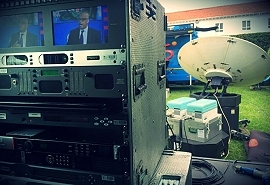 Paris, July 2015: Globecast has successfully broadcast the world feed and a wide range of other transmission services for President Obama’s official visit to Kenya and Ethiopia. The visit has garnered headlines around the world, particularly as Kenya is the home country of the President’s father. Globecast was contracted to broadcast the live feed for the three-day 2015 Global Entrepreneurship Summit (GES), held in Nairobi, Kenya, on July 24th-26th that President Obama launched. It also provided the primary and backup link at the State House in Nairobi for the joint presidential press conference between President Obama and President Kenyatta of Kenya. On behalf of the White House, during both these events Globecast also delivered an international feed of the main speeches to broadcasters in Europe and the US. Globecast also provided live shots from its Nairobi offices for a wide range of international broadcasters while the American pool also benefitted from a TVRO feed at their hotel, supplied by Globecast, so they could receive the pool content that was available. When the visit moved on to Ethiopia, Globecast continued its role, supplying transmission services to the American pool, which was managed by CNN. It deployed a dual-path MPEG-4 HD uplink in Addis Ababa at the hotel where the US journalists were based.